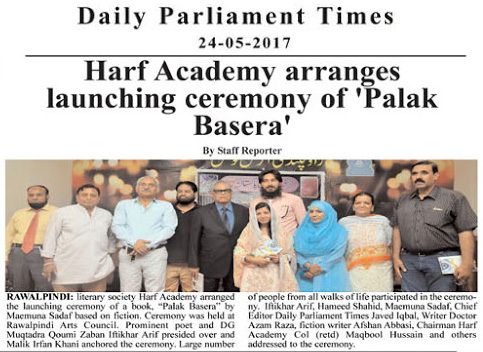 literary society Harf Academy arranged the launching ceremony of a book, “Palak Basera” by Maemuna Sadaf based on fiction. 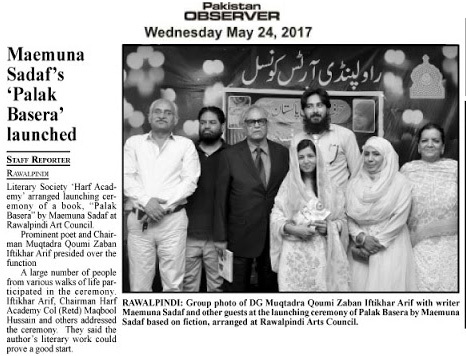 Ceremony was held at Rawalpindi Arts Council. Prominent poet and DG Muqtadra Qoumi Zaban Iftikhar Arif presided over and Malik Irfan Khani anchored the ceremony. Large number of people from all walks of life participated in the ceremony. Iftikhar Arif, Hameed Shahid, Maemuna Sadaf, Chief Editor Daily Parliament Times Javed Iqbal, Writer Doctor Azam Raza, fiction writer Afshan Abbasi, Chairman Harf Academy Col (retd) Maqbool Hussain and others addressed to the ceremony.